Deciding to register for a half marathon when you’ve never ran one before and your version of exercise is getting up to check if anything new has appeared in the fridge is understandably intimidating. But despite what the fear inside your head is telling you, running a half marathon is an achievable goal. Don’t get me wrong, training for a half marathon is quite the commitment. But compared to the typical 16-20 week training period for a full marathon, most half marathon training plans are only 12 weeks long. Even better, it only starts to become slightly more time consuming during the last three to four weeks when your long runs get really long and your recovery runs aren’t just three miles anymore. This might be the best part about training for college students (or anyone that’s on a tight budget!). While you do need to put in the effort and time into training for a half marathon, it’s fairly inexpensive. Aside from the $30-$100 registration fee (the earlier you register, the cheaper it’ll be) and $50-$120 running shoes there’s no recurring fee that comes along with training for a half-marathon. Who needs a gym membership when you can just lace up your shoes and enjoy the outdoors while getting your training run in? Trust me, it’s way more exciting than running on a treadmill! My favorite reason of them all! You’ll be exercising five times a week when training for a half marathon. That means you need at least 5 outfits you can work out in depending how often you do laundry. While completely unnecessary, training for a half marathon is a perfect reason to update your athletic wardrobe if this is something you are going to see through. As the number of races I’ve run has grown, so has the number (and quality!) of athletic wear I own. Only check out Popflex’s Instagram if you want to look cute out on the course! If there’s another type of person that has better aerobic endurance than a half marathoner or marathoner, I’d love to talk (and potentially work out) with them. When you’re out there running five times a week and increasing your mileage for 12 weeks there’s no getting around that increase of aerobic endurance! This increase is valuable because it will translate to any other workout you do. That H.I.I.T (high intensity interval training) workout your friend wants you to do with them might seem scary but you’ll make it through. You’ll even recover much faster than you would if you weren’t a runner! Some days you might not enjoy running out there by yourself. Come race day you’ll be surrounded by hundreds, sometimes even thousands, of runners that share the same excitement, passion and motivation you have. The energy at the starting line, out on the course and across the finish line is unlike anything you’ll experience. I’ve finished races faster than I expected just because I was oblivious to the fact that I was running. There was just too much excitement going on around me! Half marathons are awesome because once you’ve finished those 13.1 miles you’re exhausted but you’re not destroyed. You’ll definitely be sore, tired and in need of food and a nap but you should be fully recovered in a day or two compared to the week of recovery you might need after running a full marathon! What’s even better is your recovery time shortens with each half marathon you train for and complete. There is no motivation to get to the finish line like thinking about the awesome medal that’s waiting for you! Hobbling around and showing it off for the rest of the day is one of the most awesome feelings you’ll ever experience. The bigger and more popular the race, the bigger the medal! 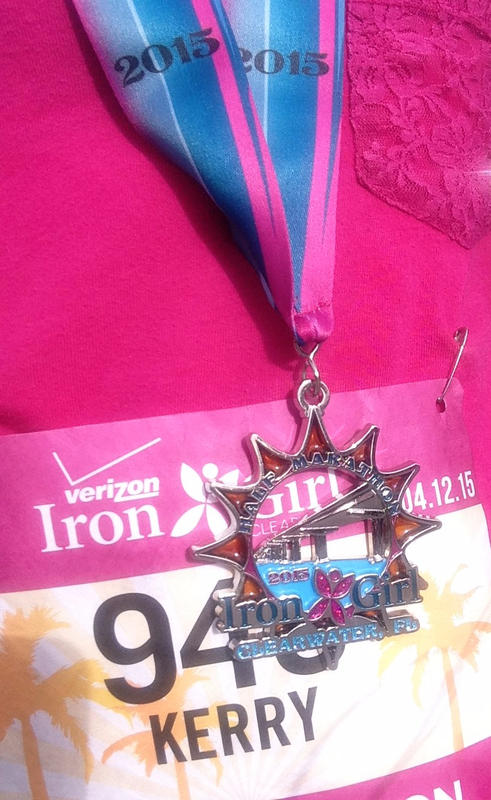 My first half marathon was the Iron Girl Half Marathon in Clearwater, Florida back in 2015 and the only thing better than the race itself was the awesome medal. Look at how cute it is! It’s still my favorite. Nothing has built my confidence like getting through those long runs and then crossing the finish line, especially as someone that grew up with ZERO athletic experience. If someone told me in high school during all those awkward and uncomfortable days in gym class that I would run even one half marathon I would have thought they were just mocking me. Running a 5k or even a 10k is fun, but it’s not that big of a deal. 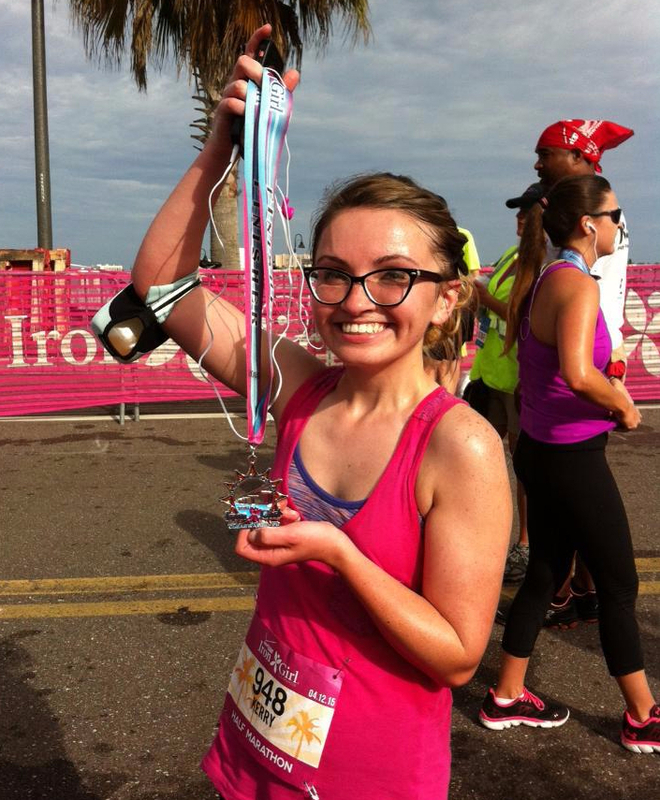 Half marathons are a bigger accomplishment. Waiting to celebrate at the finish line is typically a DJ, free food and samples of protein bars and supplements. You’ll find all sorts of stuff you’ll want to stuff in your bag before you limp back to your car. When you’re at the starting line for a race it might feel like the whole world is there and you’re going to be trampled and left in the dust. But much to your surprise it’s actually a much smaller number. According to Running USA only 1,986,600 people in the United States completed a half marathon in 2015. That may sound like a lot but compared to the more than 300 million people that live in the United States it’s hardly even a fraction! Being part of that small number is a crazy accomplishment. Getting to be part of the even smaller number of people that have run multiple half marathons is even crazier! This has never been an important part of training for me, and it shouldn’t be for you either. Regardless of your motivation, you are obviously going to burn more calories than you did before you started training. You’ll notice the number on the scale going down the further you get into your training. Like I said earlier, those long training runs can get tedious and boring when you’re out there by yourself. On race day this will be totally different. You get 13.1 miles of people you don’t even know cheering you on and empowering you to the finish line, and you’ll feel like a total rock star! Since my lifestyle is still “broke-college student” and is about to transition to “broke graduate paying back student loans” I’ve only run local races. They’re convenient and inexpensive. 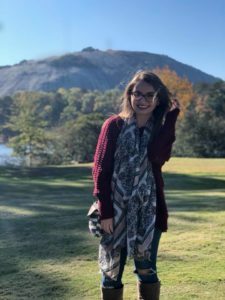 But for those of you with a little more wiggle room in your budget, signing up for a half marathon in another city or state can be turned into a mini weekend getaway. New Orleans, Boston, Chicago, Disney…the possibilities are endless! Just keep in mind you’re running 13.1 miles at the end of it, so don’t do anything too crazy while you’re there. The coolest part of the whole process is crossing the finish line and seeing all of your hard work and dedication pay off. 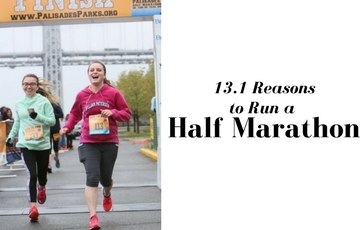 You just ran 13.1 miles, there’s nothing you can’t accomplish! Like eating an entire pizza afterwards, for example. And yes…by yourself. Besides the cute popflex clothes all these reasons make me want to sign up!! Thank you for this!! 🙂 I’m getting off the couch!